As I began to philosophically recontextualize Carroll, the man behind the myths began to emerge. It became obvious that myth, in its most primary sense, was as essential to Carroll as it was to Plato. As I began to see the structure of the myth that Carroll was making, the myths that had surrounded him fell away quite naturally. Rather than merely being the subject of the myths, Carroll became a myth-maker. The myth he crafted, however, was neither social nor sexual…it was spiritual. 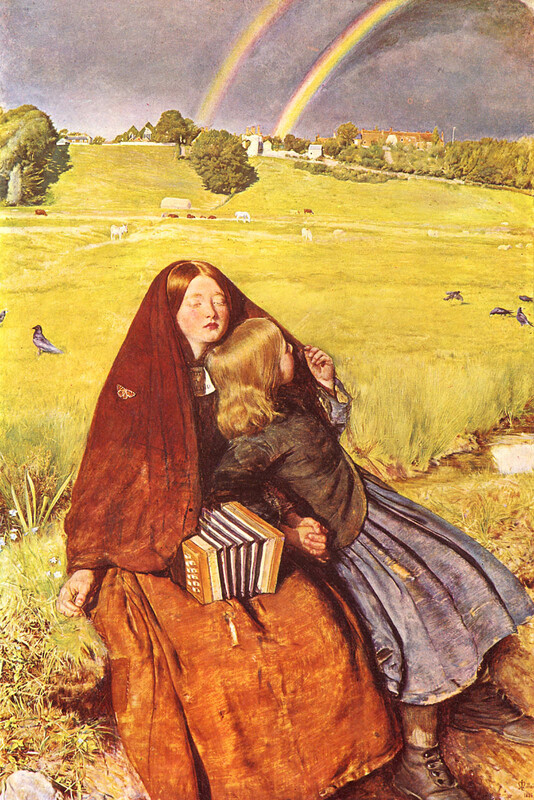 Many of the myths that surrounded Carroll sprung up, in fact, out of a failure to understand Victorian esoteric trends. What has been referred to as the nineteenth century universality of a fad for child prodigies was not actually a fad at all. The Victorian Cult of the Child was, more accurately, a reappearance of the Orphic theogony for the belief in a divine child. In Orphism, the belief was illustrated by the existence of an actual cult that took the Child for the center of its worship and caused his/her adorers to give to him/her as offerings the sort of gifts that may most naturally be supposed to please him/her, namely children’s playthings. (WKC Guthrie, Orpheus and Greek Religion) In order for the divine child to mature into his/her full potential, initiation was required. The concept of initiation was central to both ancient and nineteenth century mystery schools. The thrust of the initiatory process was for the candidate, through a series of trials, to obtain a direct experience of, as opposed to doctrinal instruction about, divinity. Alice, Carroll’s symbol of the divine child, visited the underworld, as an initiatory candidate, as a part of the process of achieving gnosis. Carroll had been cultivated toward the priesthood from infancy and was expected, as a condition of his residency at Christ Church, to proceed to holy orders within four years of obtaining a master’s degree. He, however, demonstrated reluctance to do this. After delaying the process for some time, he eventually took deacon’s orders in 1861. When the time came, however, for Carroll to proceed to full orders, he appealed to the dean for permission not to proceed. This violated college rules and he was advised that it was probable that he would have to leave his job if he refused to take orders. Carroll never proceeded to full orders and Dean Liddell, for reasons unknown, permitted him to remain at the college. Although there is no conclusive evidence as to why Carroll declined the priesthood, it is quite likely that he was entertaining serious doubts about the Anglican church. It is most conceivable that his interest and involvement in the nineteenth century Platonic revival, as well as in the subsequent theosophical movement, substantially changed his spiritual direction. The exoteric structure, for him, of the Anglican church may well have been supplanted by esoteric insight. Rather than knowing about (episteme) truth, Carroll chose a path through which he could know (gnosis) Truth. This being so, Carroll chose to sing a new song. Instead of dogmatic liturgy, he sang the theosophist’s intellectual hymn to Love and preached from carefully crafted allegory instead of from a pulpit. the departure, an initiation and the return. The process of becoming conscious requires forming unity out of a pre-existent state of fragmentation. This is achieved through an integration of the ego with the more authentic self, forming a transcendent wholeness. This struggle to achieve a transcendent wholeness, the act of self-recollection, is the heroic struggle. Similar to the Platonic doctrine of anamnesis, the hero is required to gather together what is scattered, of all the things in him/her that have never been properly related, and to come to terms with him/herself with a view toward achieving full consciousness. 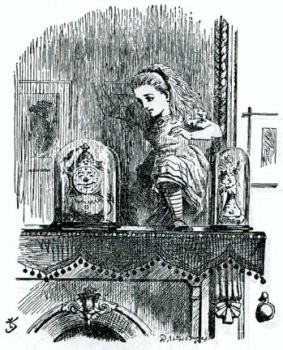 Alice, as an alter-ego for Carroll’s transcendent heroic self, underwent a gentle initiation in Wonderland so that Carroll could share, discretely, his secret of gnosis. Heeding the advice, written centuries earlier by Roger Bacon, Carroll concealed his secret carefully, leaving it so that it could be understood only by the efforts of the studious and wise. Carroll here uses same words eat and drink as in the symbolic eucharistic rites of the pagan mystery schools. This being so, it seems probable that eat and drink are used here as symbols for spiritual transformation. Ancient historic Greece had two religions, one a public expression which eventually became associated with the Olympian deities; the other, a private expression connected with the Mystery schools such as those of Eleusis. In the Lesser Mysteries, the rites and ceremonies presented a dramatic form of wisdom-teaching which explored the nature and destiny of man. In the Greater Mysteries, after more direct instruction, a confrontation was presented between the candidate and his innermost being, revealing a self higher than the daily persona or mask. Comparison of the rituals of the Lesser Mysteries, as practiced in the ancient world with slight variations of detail, all reveal a universal story of the descent into the underworld. The candidate, egoistically, “dies” in the regions of the underworld, the lower spheres, where he meets and conquers a myriad of difficulties. Shedding his impermanent self, he dies in giving birth to mastery. In the Greater Mysteries, the passage into the underworld ceases to be a mere ritual. The candidate must now approach “the confines of death” with full knowledge, and in the garment of soul-consciousness pass beyond the veil of order into the theater of chaos. “It is one of the fundamental teachings of occultism that nothing can be truly known which is not experienced, lived through.” The mystic death consists not only in one’s ability to receive spiritual light, but likewise in one’s power to face with equanimity the ravages of entropic chaos. To weld one’s consciousness with beings in spheres lower than the human is a significant test of the spiritual stamina of the individual. It is, in fact, Persephone’s quest. There is substantial evidence that before experiencing the final soul shattering vision of the Greater Mysteries, initiates drank kykeon, an entheogenic potion made from the Claviceps purpurea (ergot) of wheat or barley cultivated on the famous Rarian plain adjacent to Eleusis. The Eleusian initiates, after drinking the kykeon, then spent the night in a darkened hall, where they beheld a great vision, which was new, astonishing, and inaccessible to rational cognition. Intoxicating substances, throughout arcane literature constituted a symbol for one being liberated from the limitations of their ordinary consciousness and being lifted into a higher order of knowing and being. 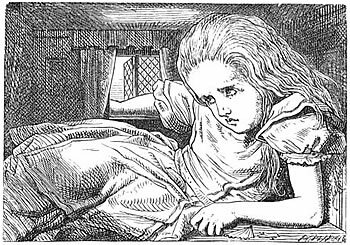 Alice’s being repeatedly instructed to eat or drink various intoxicating substances, after having descended into the underworld, was reminiscent of the function of kykeon in the Eleusian mystery schools. The Wonderland mushroom, suggestive of the Amanita muscaria, takes a central position in this context, as the caterpillar instructs Alice to eat it in order to change sizes. Interestingly, the caterpillar is a principal symbol for transformation…the foreshadow of the chrysalis. Thus, the symbol for transformation sits atop the transformational agent, the psychoactive mushroom. After ingesting a Wonderland version of the kykeon, Alice’s subsequent adventures illustrate the mystic’s death, as she summons the power to face, with relative equanimity, every manner of unusual being that the underworld has to offer. and down, and wriggling like an eel, as he came along, with his great hands spread out like fans on each side. )” The King assured Alice that his attitudes were not strange at all, since “He’s an Anglo-Saxon Messenger—and those are Anglo-Saxon attitudes.” Carroll’s Messengers appear to have behaviors similar to the “Anglo-Saxon Attitudes” in the Codex material. Further, Tenniel’s illustrations of the Messengers, Haigha and Hatta are extremely similar to the line drawings in the original manuscript. The Anglo-Saxon Messengers in Through the Looking Glass, Hatta and Haigha, are Mad Hatter and March Hare from the Tea Party in Wonderland. Tenniel lets us in on the secret by showing Hatta still with his cup of tea, sandwich and high hat. Carroll’s curiosity in Anglo-Saxon scholarship may, in fact, have been an outgrowth of esoteric interests. It was the Angle, Saxon, and Jute tribes who invaded Britain in the 5th and 6th centuries and became known as the Anglo-Saxons. Having left their homelands in northern Germany, where Apollo was said to have dwelled during the winter, they were purportedly particularly intrigued by ancient mystery cults. Their ancestral lineage was that of the mythical northern Hyperboreans. The exact location of the Hyperborean homeland was much disputed. As early as 1824, F.G. Welcker had become interested in linking the ancient amber route from the Baltic, where archaeological evidence for Greek contact was beginning to emerge, with certain classical myths, among which he cited as a “Celtic” story related by Apollonius in which Apollo, while among the Hyperboreans, wept amber. In Greek mythology, the Hyperboreans were a mythical people who lived far to the north of Thrace. The land, called Hyperborea (“beyond the Boreas [north wind]”), was perfect, with the Sun shining twenty-four hours a day. According to Thule Society mythology, Thule was the capital of Hyperborea, supposedly a legendary island in the far Northern regions, originally mentioned by Herodotus from Egyptian sources. In 1679, Olaf Rudbeck equated the Hyperboreans with the survivors of Atlantis, who were first mentioned by Plato, again following Egyptian sources. Supposedly, Hyperborea split into two islands, Thule and Ultima Thule, which were considered to be the center of an advanced, lost civilization whose survivors lingered in subterranean caverns, or according to some legends, within the hollow earth. It was said that surviving remnants of Hyperborea preserved ancient secrets, chief among which was the concept of the Vril, a latent source of magical energy which could be mastered by initiates via magical rituals. Although introduced by Louis Jacolliot, the concept of the Vril was then given new impetus by Baron Edward Bulwer-Lytton, in his work Vril: The Power of the Coming Race (1871). Through their mastery of Vril, the Hyperborians, known as the Vril-ya according to Bulwer-Lytton, would emerge from their subterranean sanctuaries and conquer the surface of the earth. [Interestingly enough, Friedrich Nietzsche (1844-1900) began his work Der Antichrist in 1895 with, “Let us see ourselves for what we are. We are Hyperboreans.”] With the work of Jacolliot, Bulwer-Lytton, and Nietzsche in the public arena, the mysticism of theosophy fell on fertile soil. The Thule Society, accordingly, founded in 1918, borrowed ideology from Madame Blavatsky’s Secret Doctrine (1888), maintaining a history of close contact with Blavatsky’s Theosophical Association and followers.